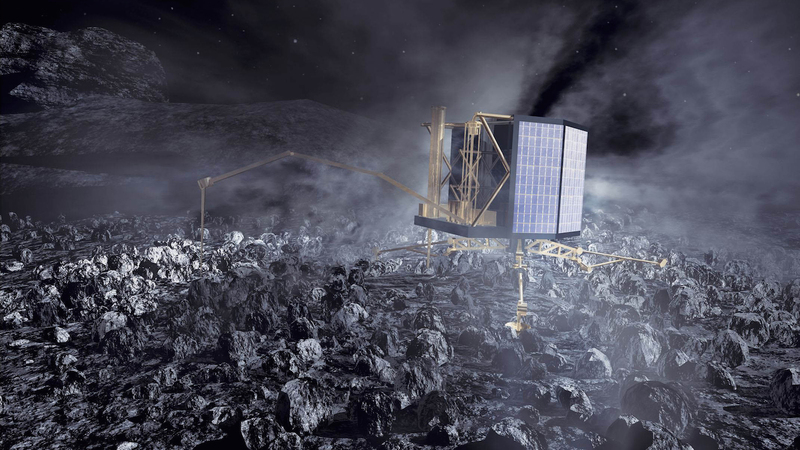 Philae has stopped responding and scientists are bidding farewell to the comet lander. The announcement was made today by the European Space Agency. The ground controllers will cease trying to send commands to the comet lander. German Aerospace Center DLR member Stephan Ulamec who is also the project manager of Philae has confirmed that the probability of receiving a signal from the comet lander is very small. The DLR which houses the control center for Philae believes that the probe has been covered in comet dust and is now shaded from the Sun. Therefore, it cannot replenish its batteries. People who have been following each step of Philae on various social media platforms were terribly disappointed at the news. The mothership of Philae named Rosetta will keep listening for signals from the little lander for another two months. Rosetta is currently orbiting the 67P/Churyomov-Gerasimenko comet which loops around the Sun. The mothership will continue to observe the comet until September, after which it will land on it and join Philae. Mark McCaughrean, senior science advisor at ESA, is of the opinion that the mission cannot be over since the lack of a signal does not necessarily mean that the lander is dead. Ulamec has stated that they did not yet shut down the receivers placed on the orbiter, but they will probably never hear again from Philae. The lander was sent by the European Space Agency to probe the comet in hopes that might enlighten us on the origins of life on our planet. Philae was carried by Rosetta for ten years across 6.5 billion kilometers (four billion miles) until they reached the comet in 2014. Philae sent valuable information to Earth and even tweeted about its exploration, gaining the sympathy of those who were watching it. Unfortunately, its last contact occurred last year on July 9. Scientists believe that by now the comet has travelled too far for Philae to gather energy to reboot. The DLR released a statement named “A slow farewell – Time to say goodbye to Philae” that reveals that the lander will enter a state of permanent hibernation because it is out of the reach of the Sun. Philae managed to send data collected with ten instruments for sixty hours before it went on standby mode. Last month, the ground controllers send commands to the lander hoping they would determine it to shake the dust from the solar panels. Unfortunately, they were not able to change its position and orient it towards the Sun and thus scientists are bidding farewell to the comet lander. Managing Drug Addiction in the U.S.